December, 2004. 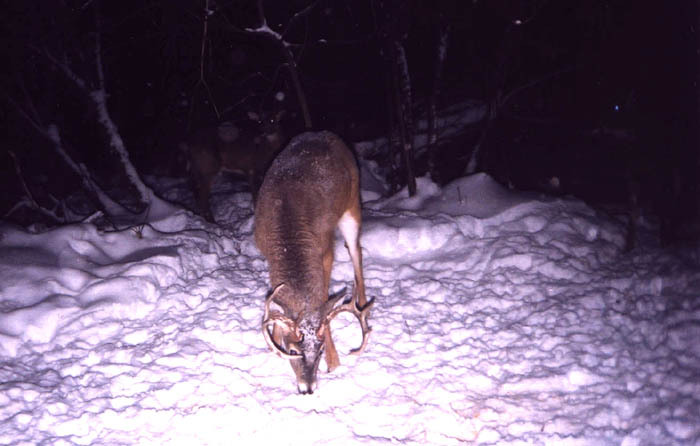 Another batch of nice bucks from northern Minnesota. Most of them survived the season, except for the last one. This one made it to the Leaderboard. 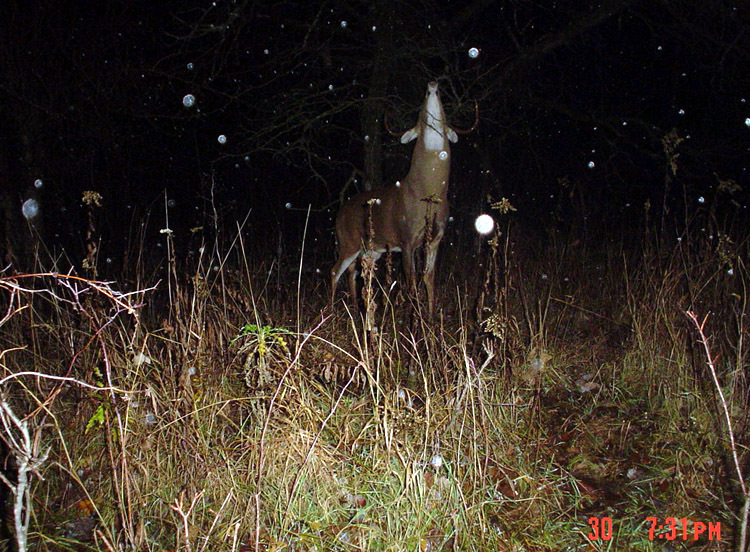 November, 2004. 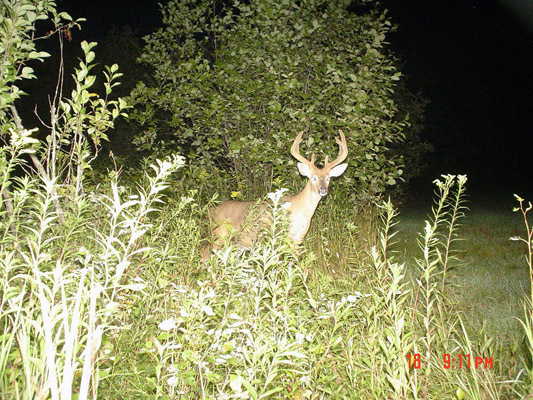 These photos were taken up north and were sent in by a friend of Minnesota Bucks. 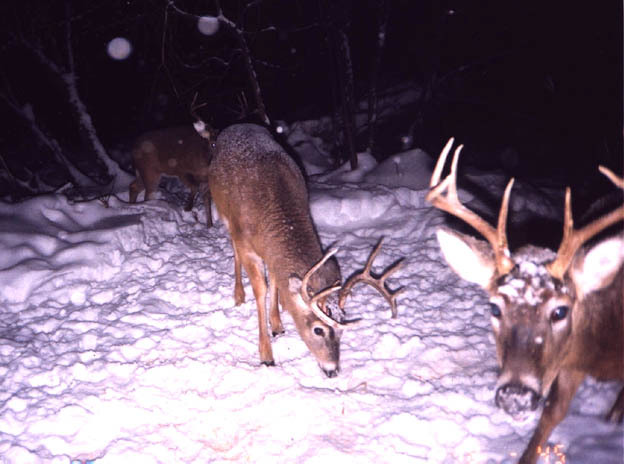 They are all bucks that have survived the gun season. November, 2004. 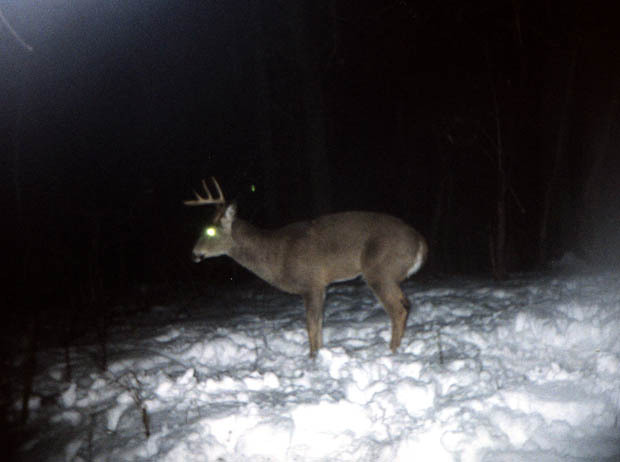 A few more nice bucks appeared on the camera by my stand. 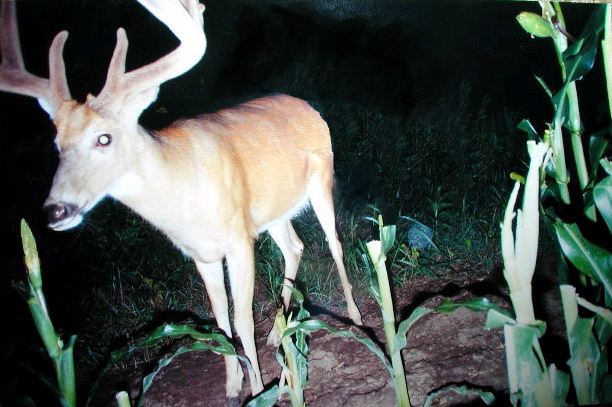 The first one is a medium sized 8pt. 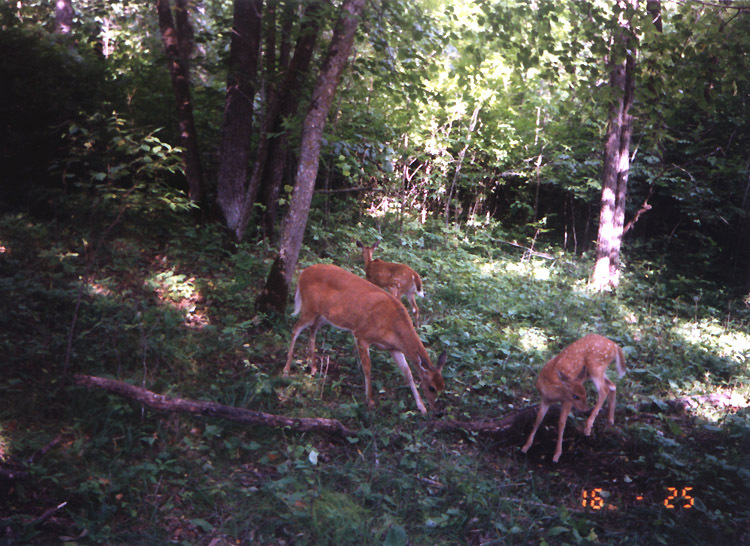 The middle one is another ten pointer, a little heavier rack and body and the last one is a very nice 8 point buck. 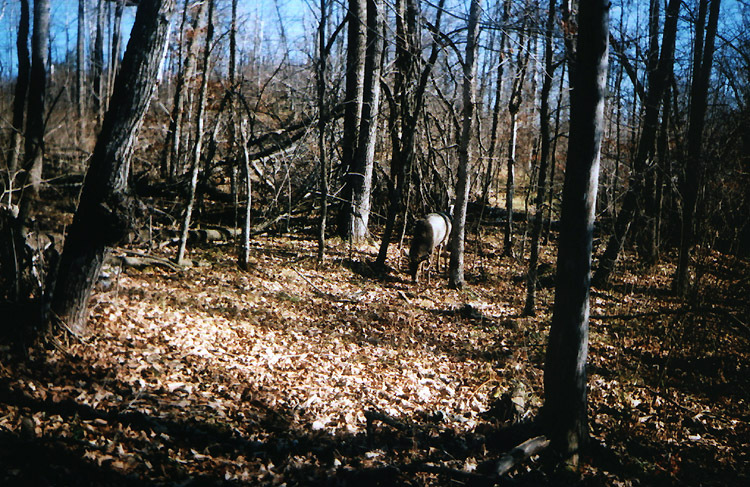 November, 2004. 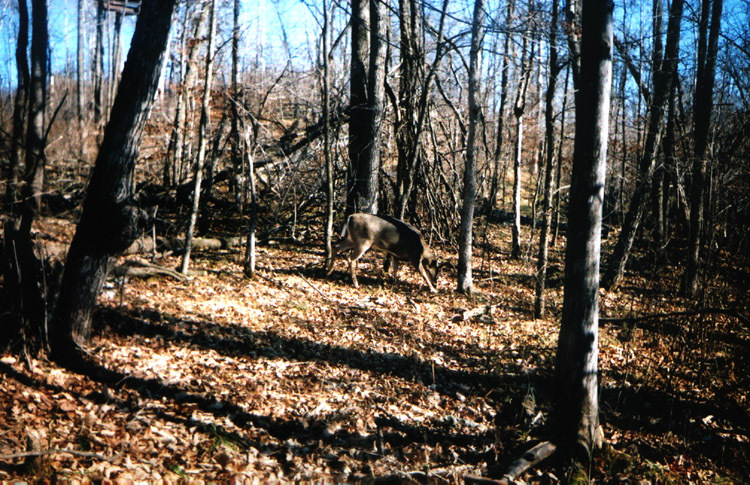 A nice ten pointer finally showed himself on the trail, not more than 30 yards from my stand (upper left corner). 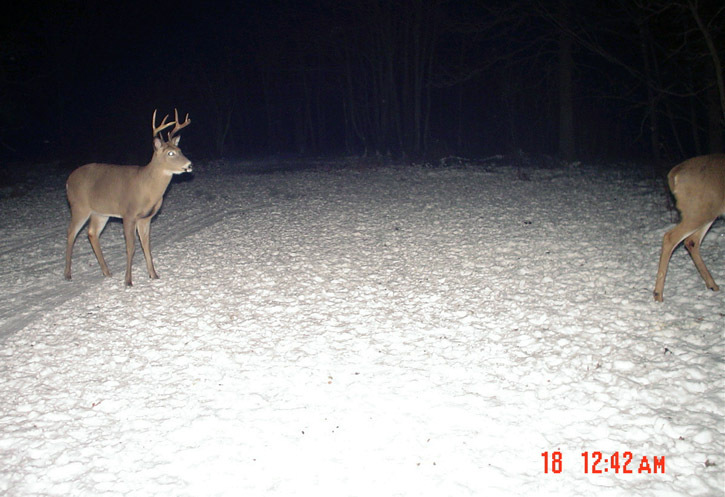 He later made a scrape on the ground right there. 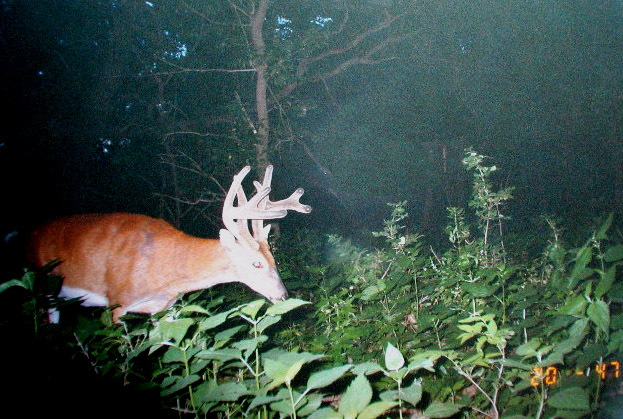 I hope this timberwolf doesn't cruise these trails while I'm deer hunting. It's still a pretty cool photograph though. 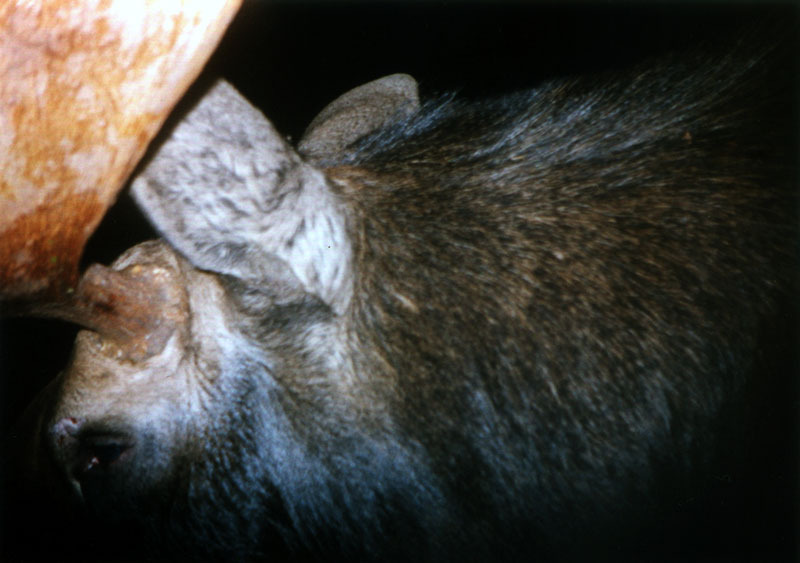 October, 2004. 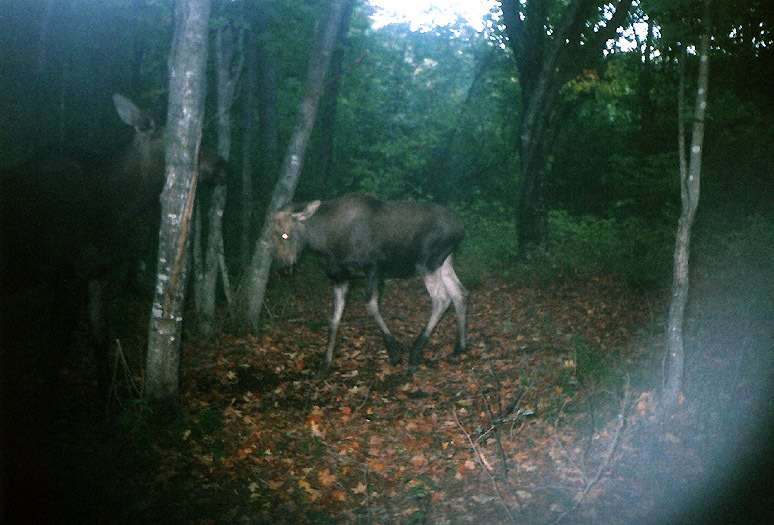 Here's a neat photograph of a bull moose. Notice the scar and blood just above his left eye. 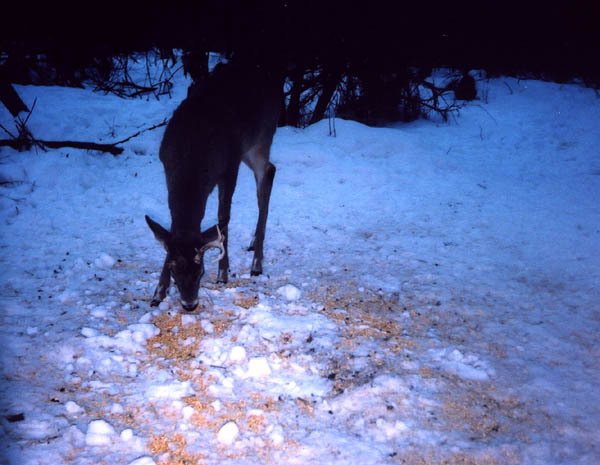 This guy is a survivor; moose season just closed. 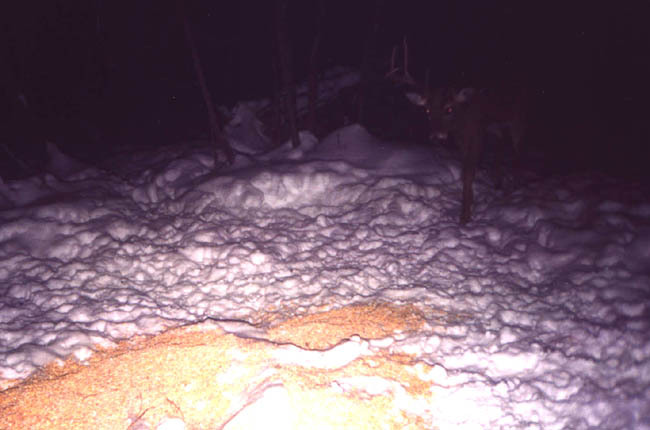 The next one is something you don't see everyday: a whitetail and a moose in the same spot. 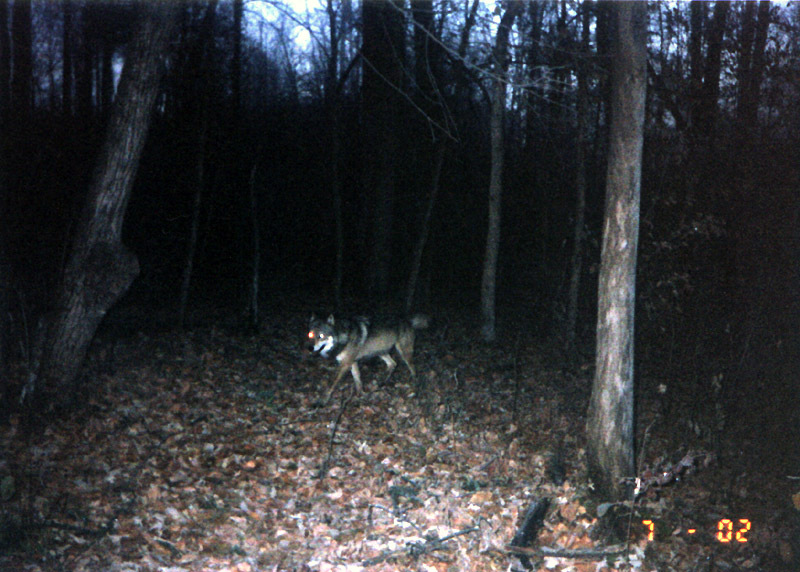 October, 2004. 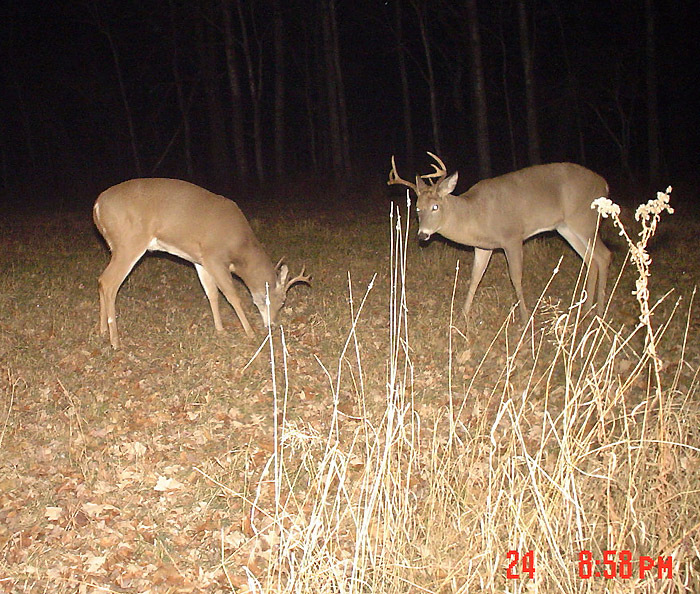 Jason Lamppa sent in these photos of some nice Minnesota bucks. 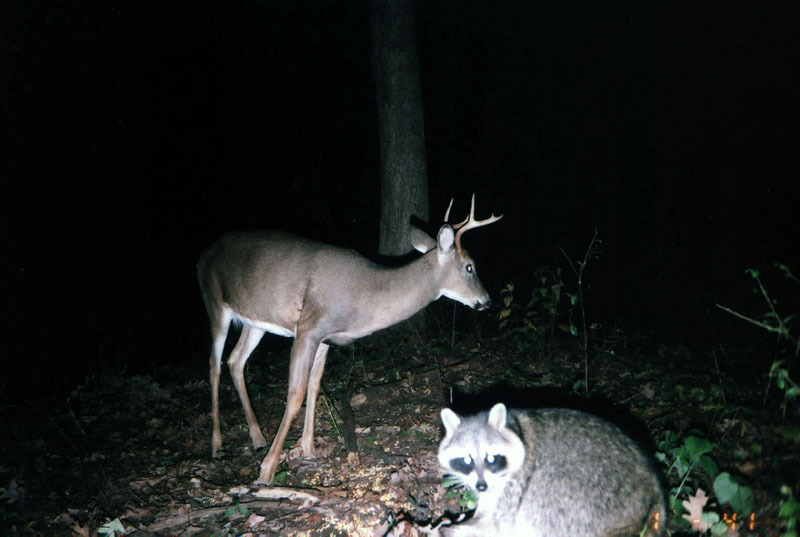 The first one shows an uncommon event: 2 different species in one photo. 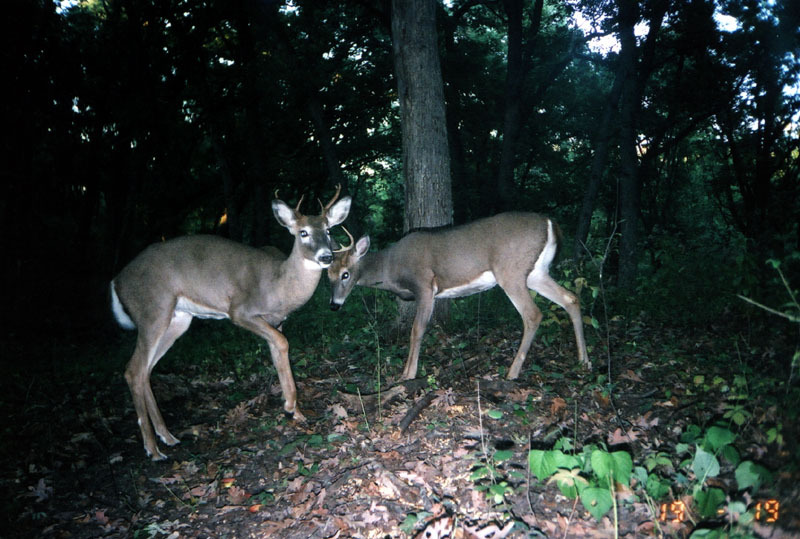 The two young bucks look to be both a year and a half old: should be nice in a couple years. 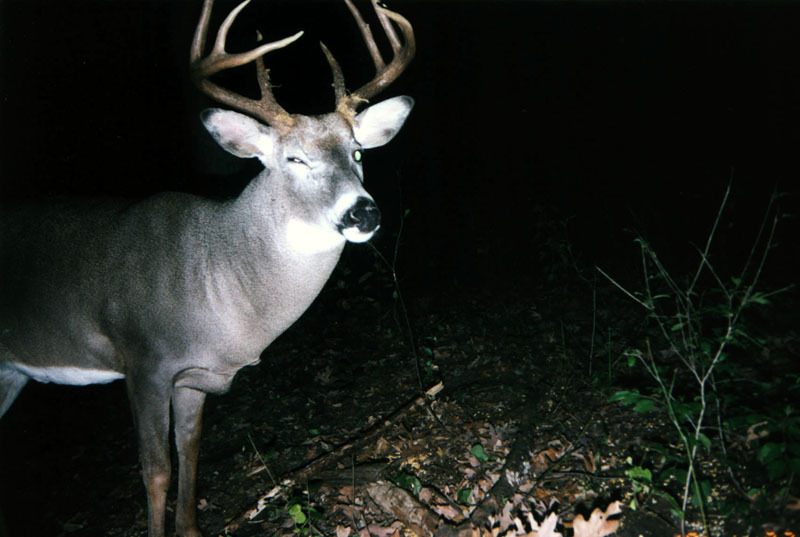 There's a couple shots of a nice ten pointer, including one of him winking. 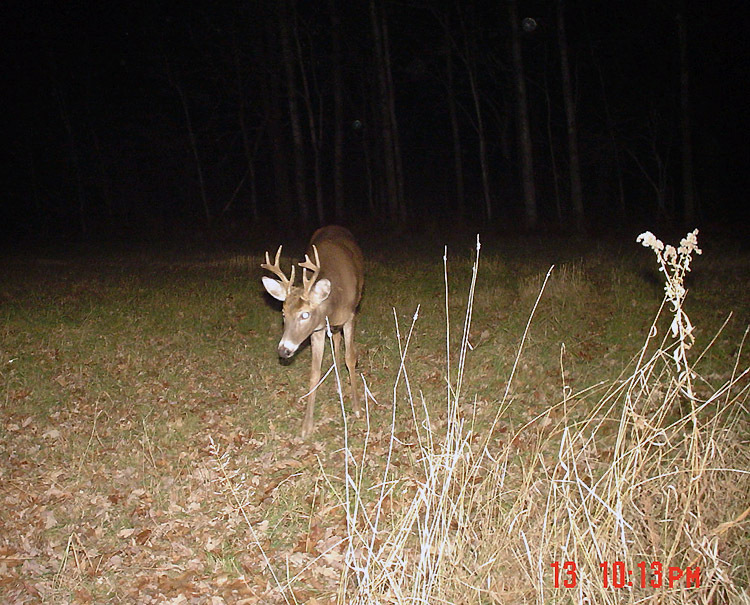 The last two photos are of a dandy 12 pointer. 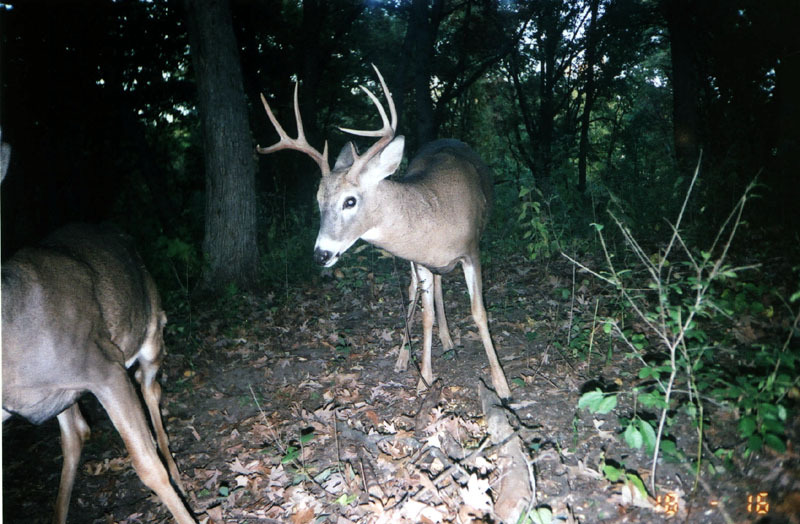 It appears to be a Boone and Crockett buck with a fairly clean, even 6x6 frame and lots of nice mass. 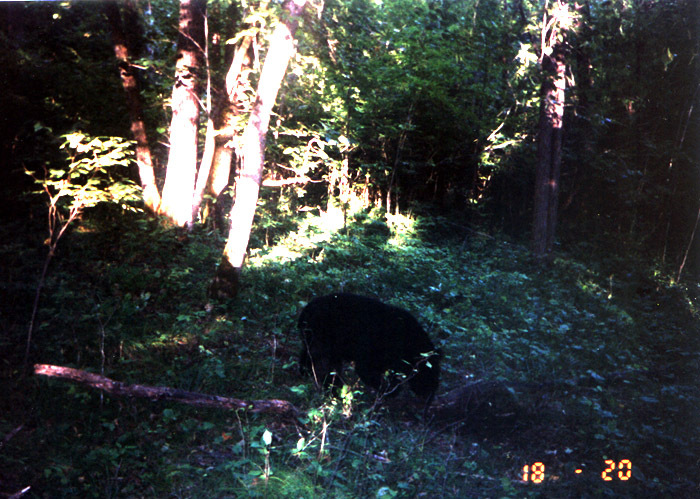 September, 2004. 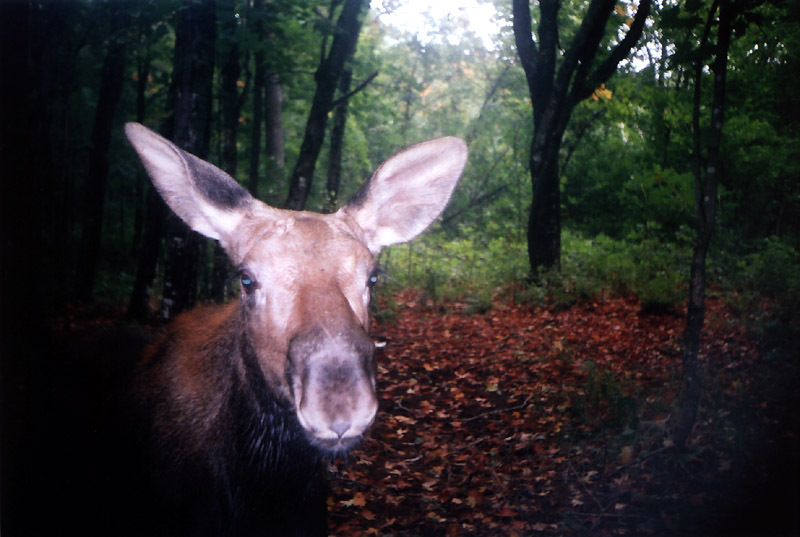 Aside from a few photos of some does and fawns, I mostly ended up with moose on my cameras this time. 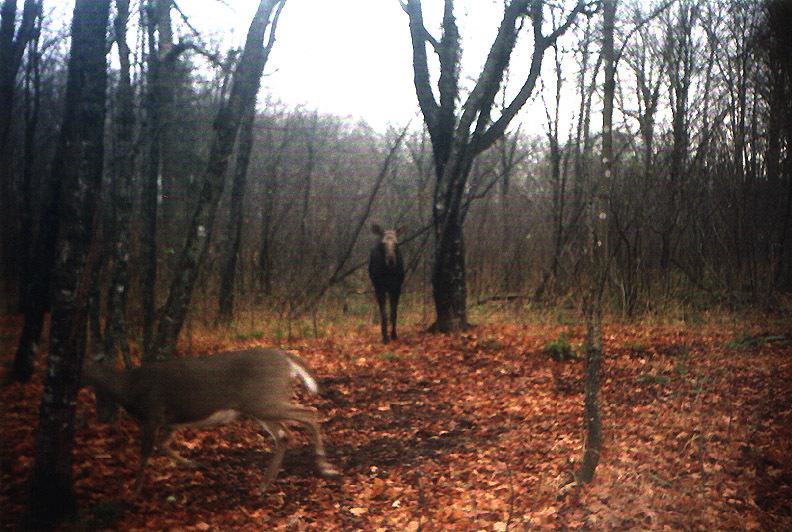 There's a couple nice shots of a cow and a calf and then a marginal photograph of a nice bull in velvet. September, 2004. 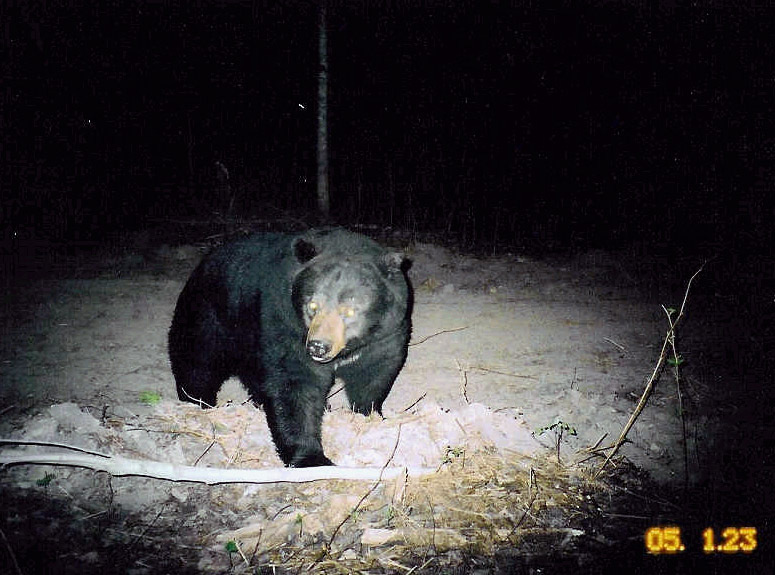 Here's a collection of some trail photos of mine from up north. 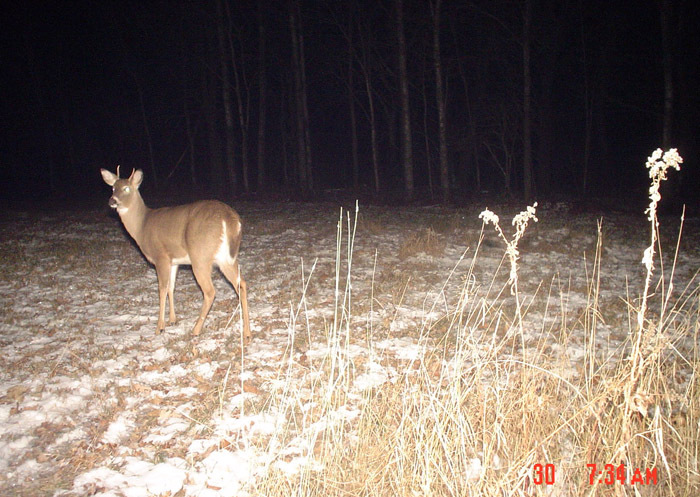 A doe with twin spotted fawns, a nice-sized black bear and a pretty good nine point buck. August, 2004. 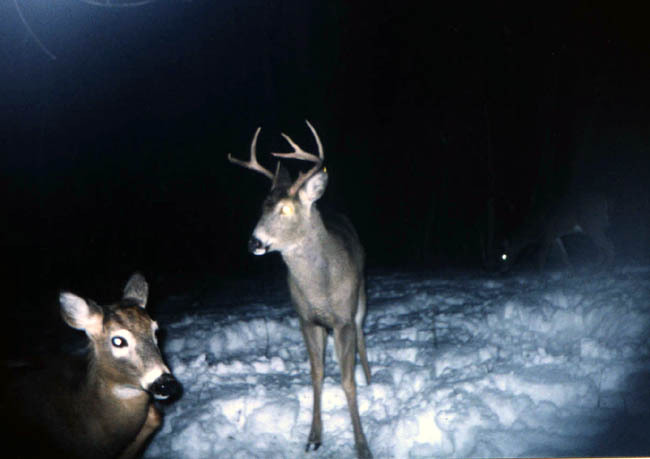 Some friends of Minnesota Bucks sent in this group of trail photos. 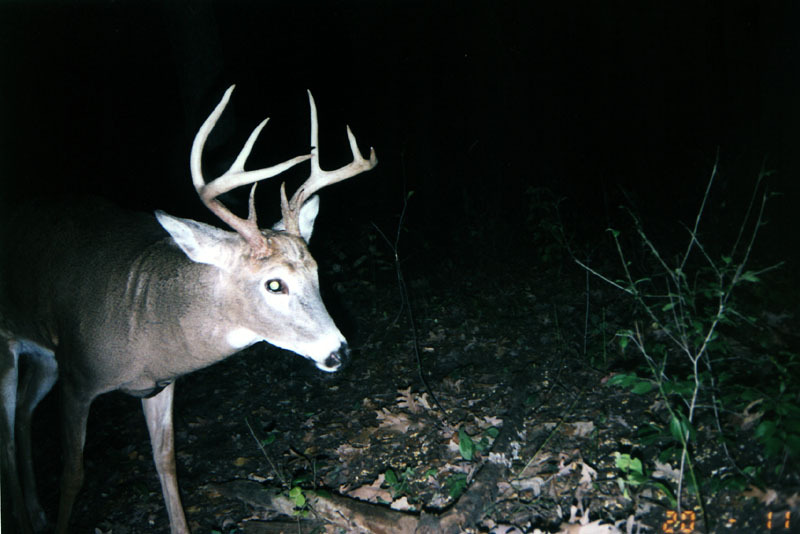 There's a few photos of a big nine pointer and an evening shot of another good 8 pointer. 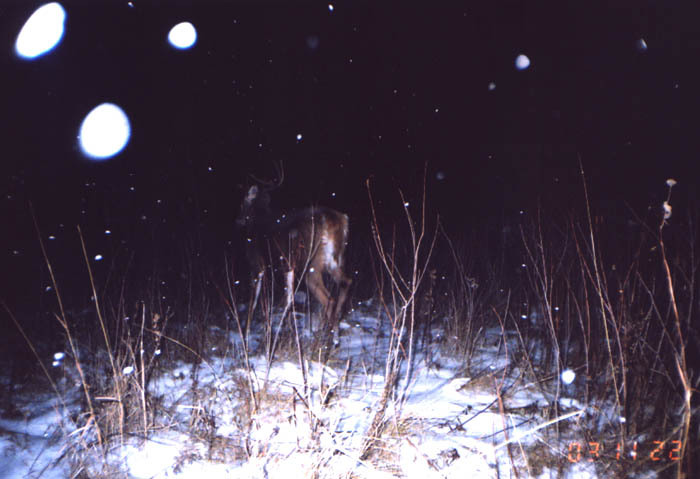 The next one shows a good-sized bear and two more nice eight pointers. 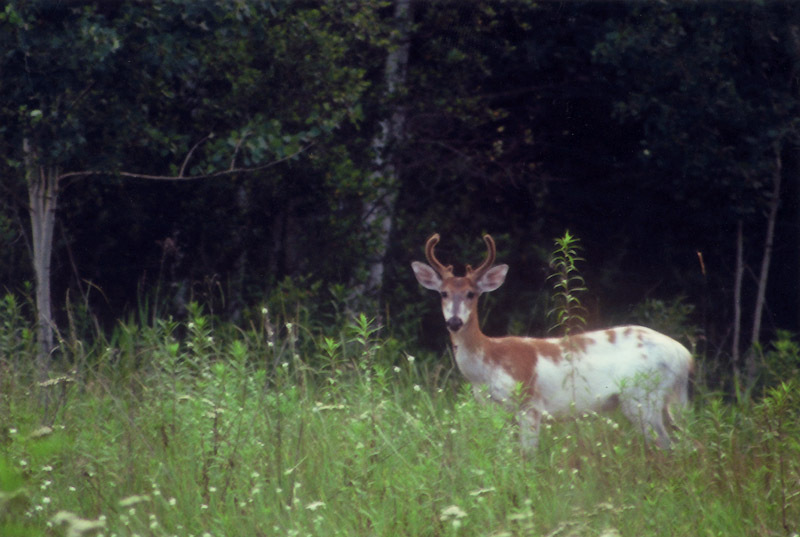 The last one is a great field photograph of a unique animal, a piebald whitetail buck. February, 2004. 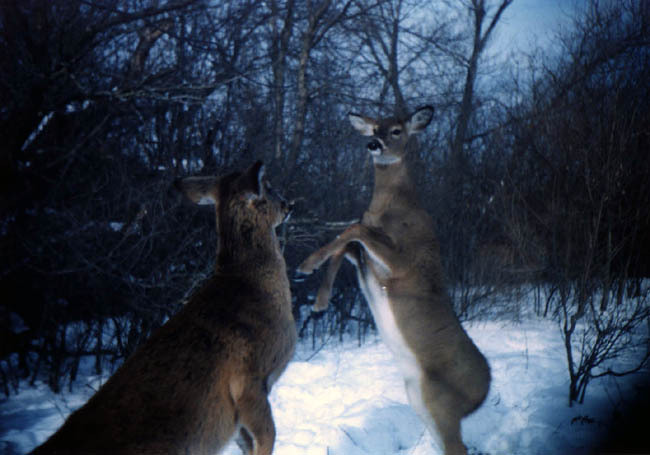 Here's a mix of deer from my trail camera. 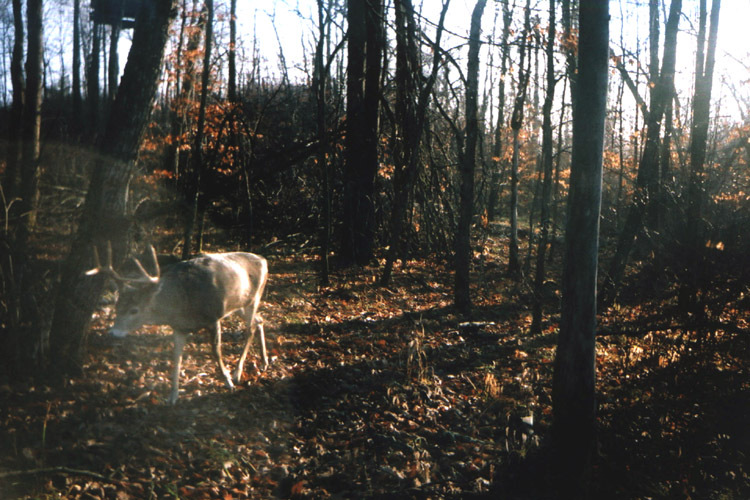 There's a couple decent bucks in here, as well as a good shot of some antlerless deer playing footsie. February, 2004. 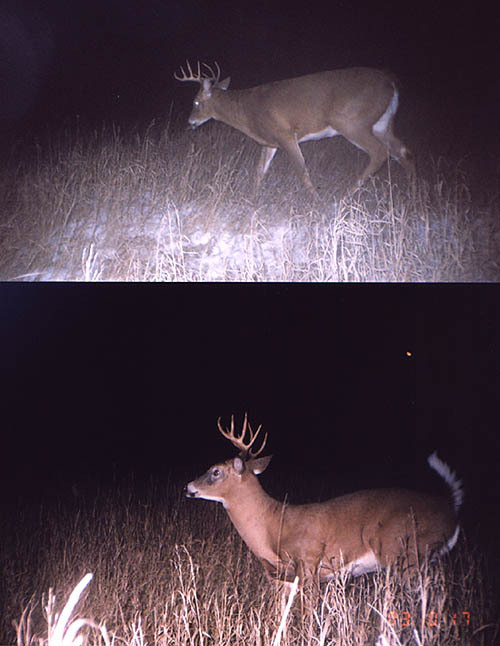 Here's a couple more Jason Lamppa photographs of some quality bucks. 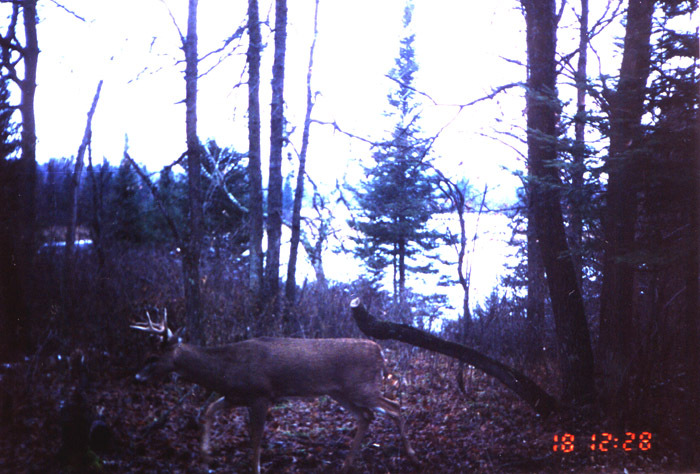 The first shows a nice nine and ten pointer. 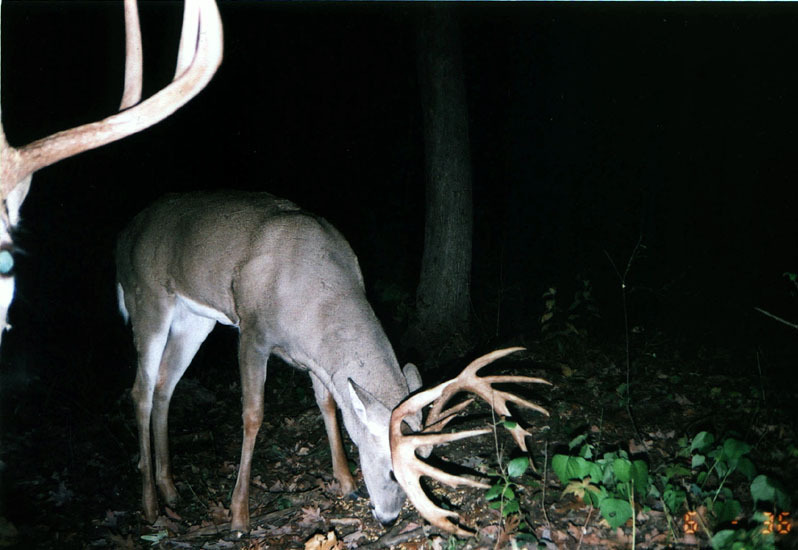 Jason found the left side shed antler from the ten point. 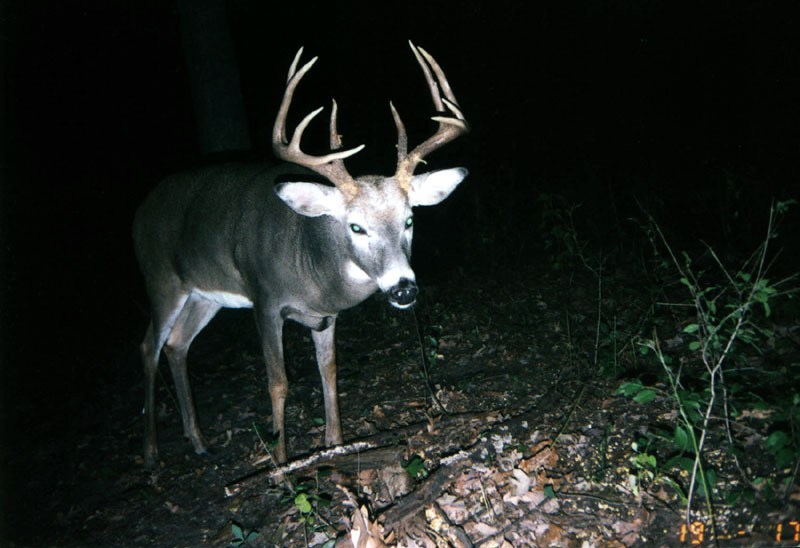 The next photograph is a dandy 12 pointer. Jason also picked up this match set while shed hunting. 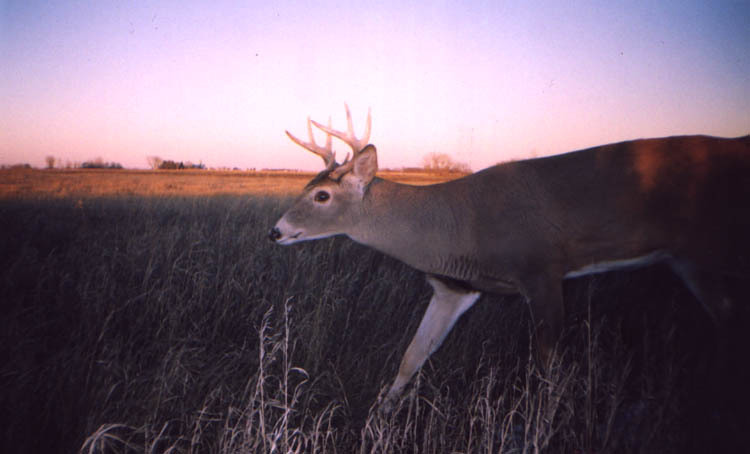 The left left side scores 65 1/8" and the right side scores 68 5/8", putting this buck in the 150" class. February, 2004. 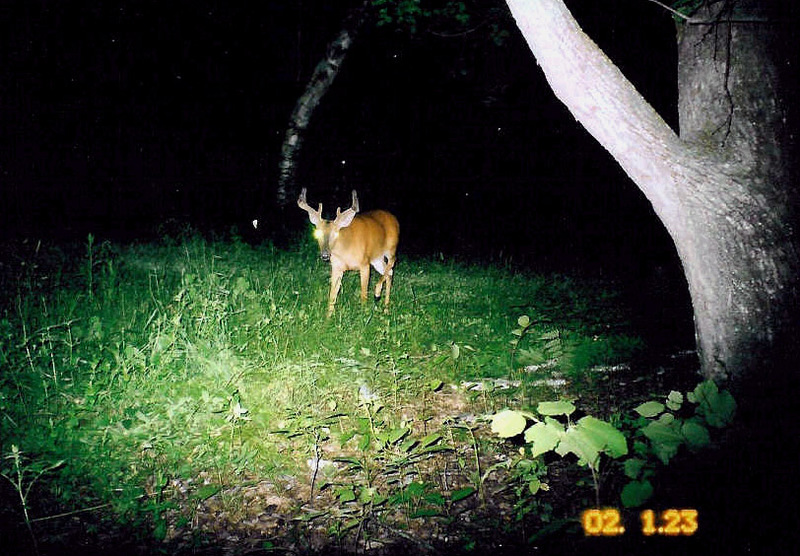 Jason Lamppa sent in this nice batch of trail camera photos. 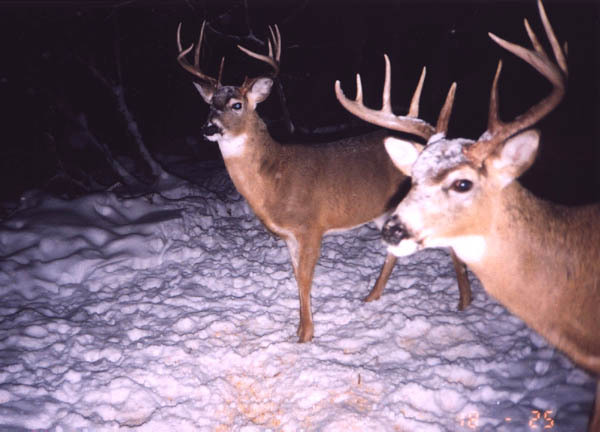 The first two are a sequence of 3 good bucks approaching the camera. 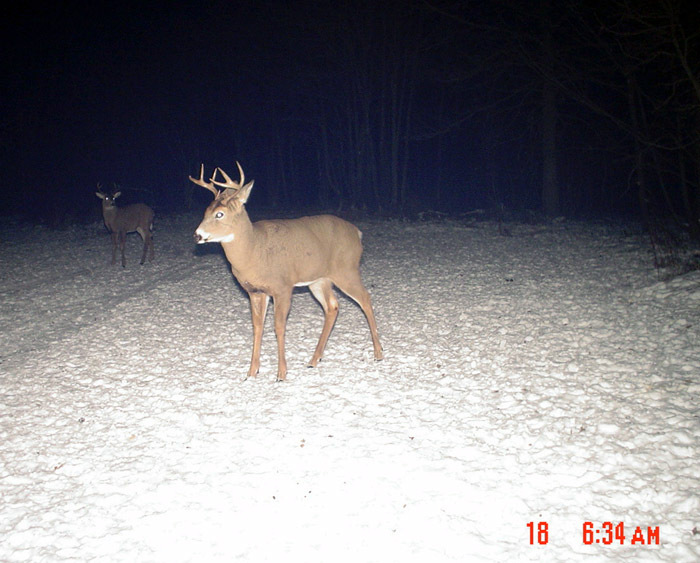 The next two show a couple 8 pointers that have shed one side. 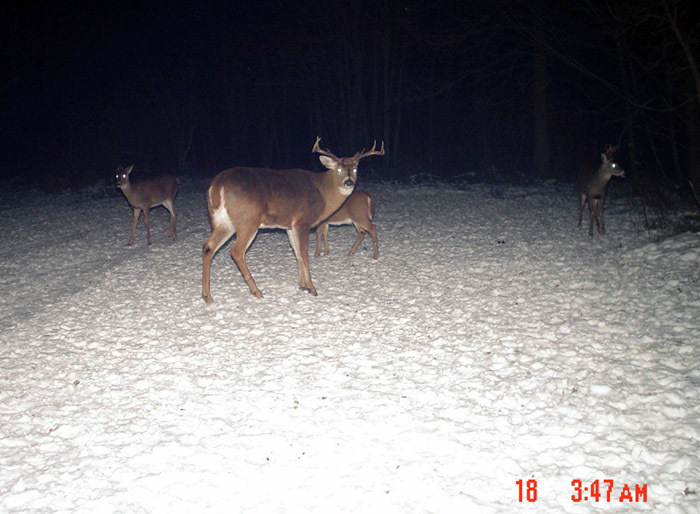 The 2nd last one is a deer to watch for the future. 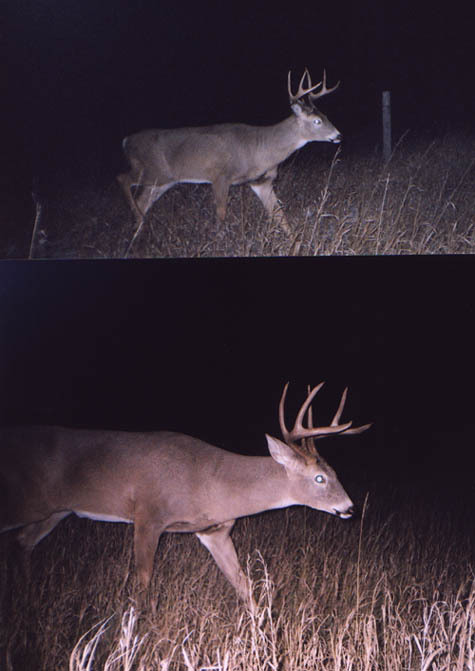 The last one is a dandy 9 pointer with excellent tine length. February, 2004. 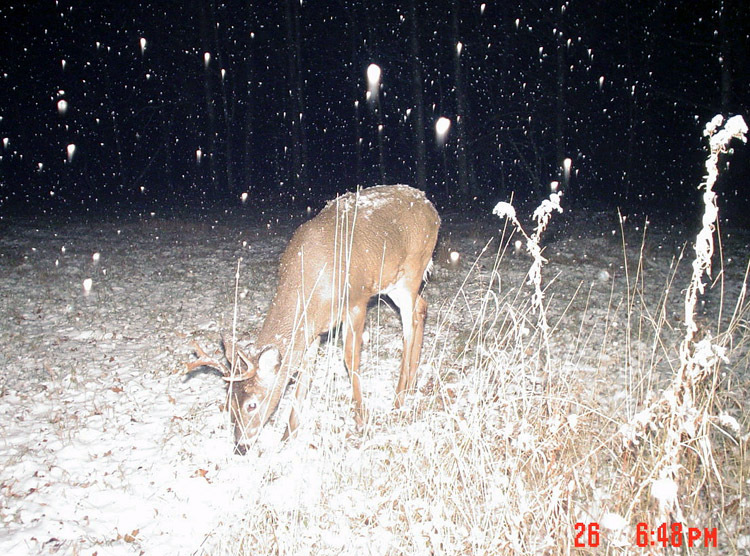 A friend from central Minnesota sent some of his better pictures in from the past year. 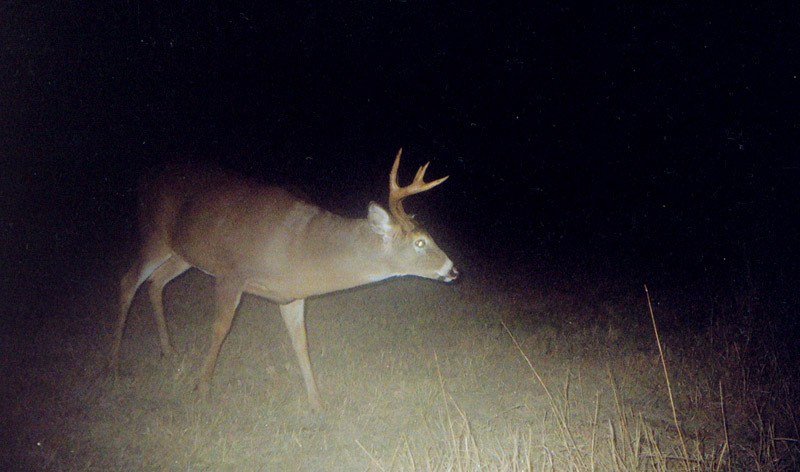 The first two eight pointers are of bucks that he hasn't seen, but believes they are still ahoof. 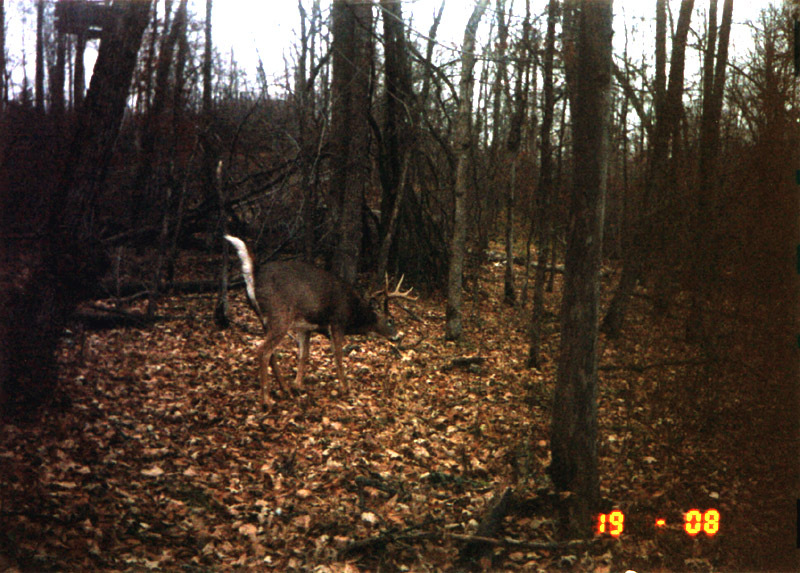 The first double photograph shows a buck's progress from 2002 to 2003. 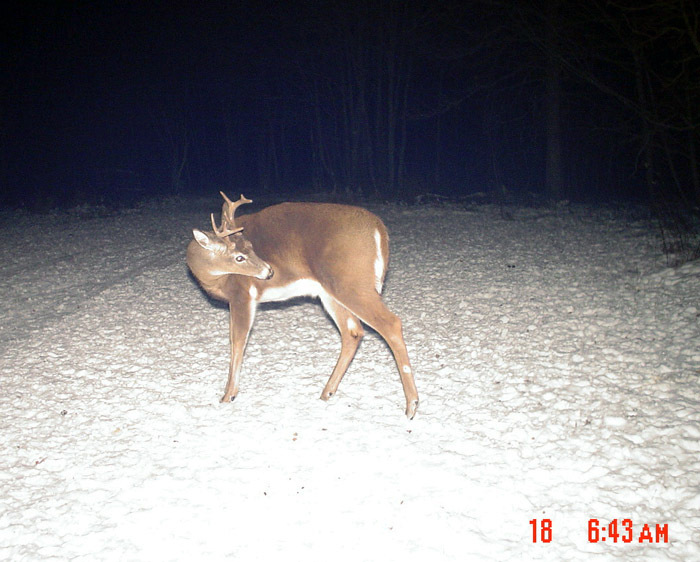 Looks like he grew a bit more mainbeam and tine length. 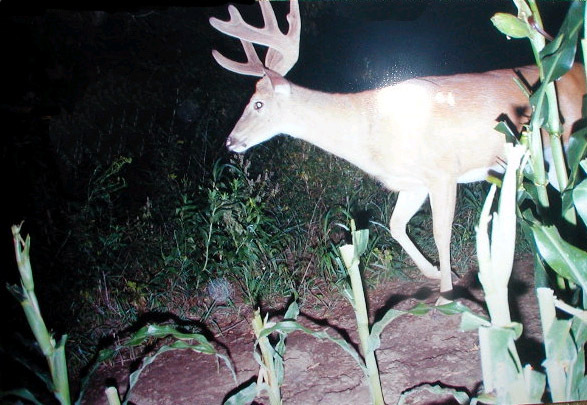 This buck was harvested in 2003, weighing 155 lbs and scoring around 125". 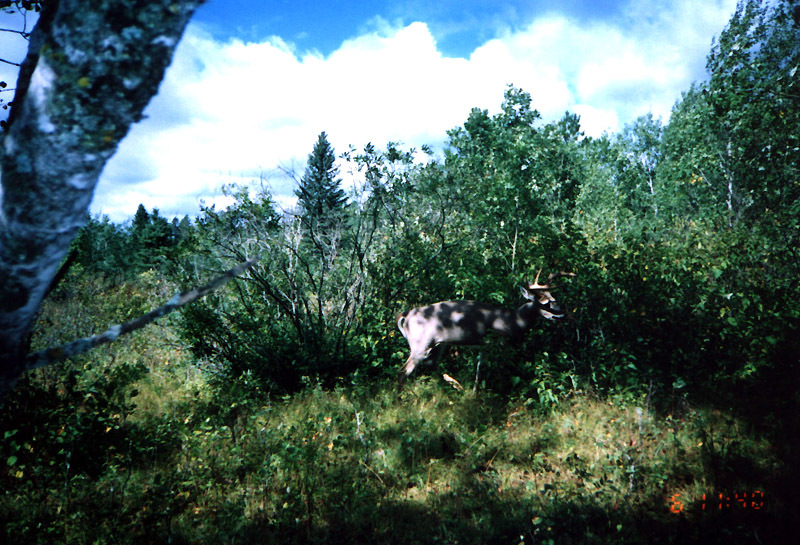 The next double photograph is of a young ten pointer. 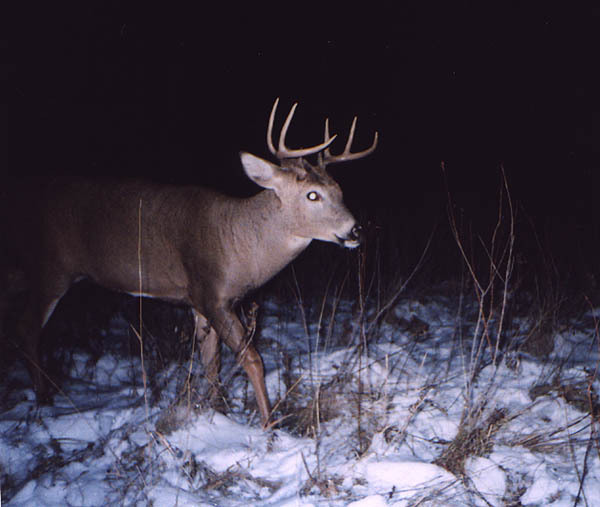 This buck had some potential, but was harvested by a hunting partner in 2003. 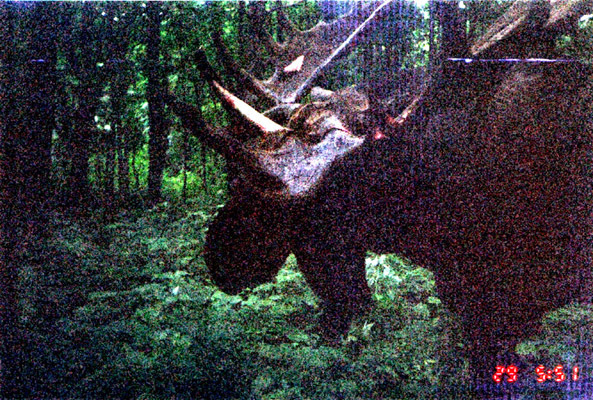 He weighed 178 lbs and scored around 130". 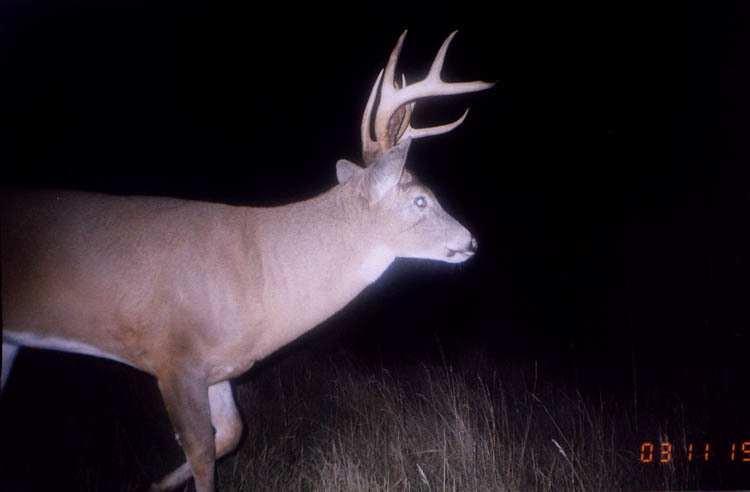 The next large buck is still alive, having survived some shooting. 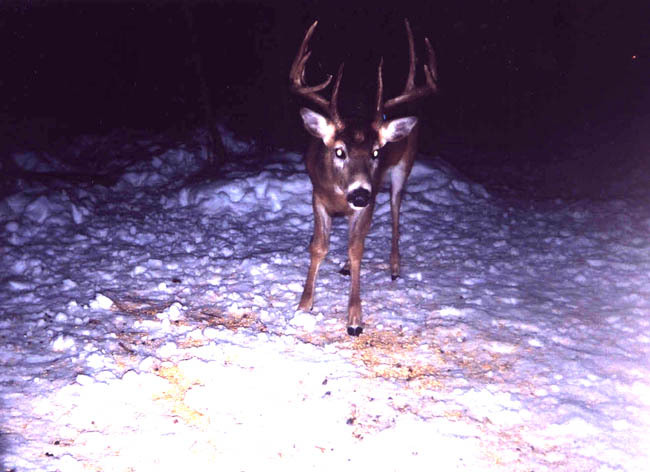 His left antler appears to have been shot off. 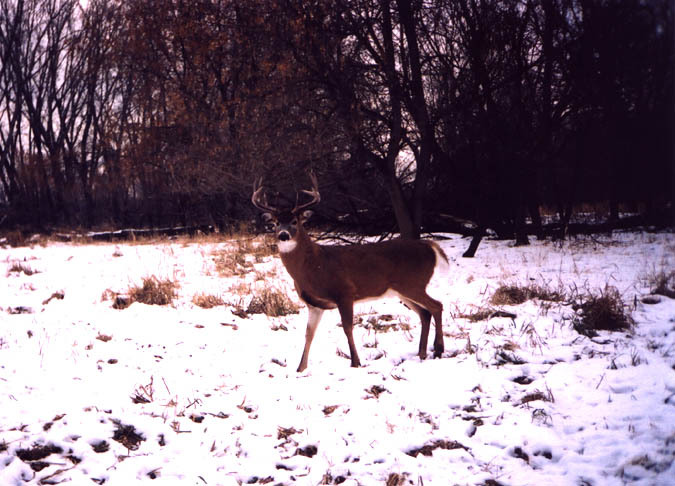 This buck was videotaped in October with a full rack. 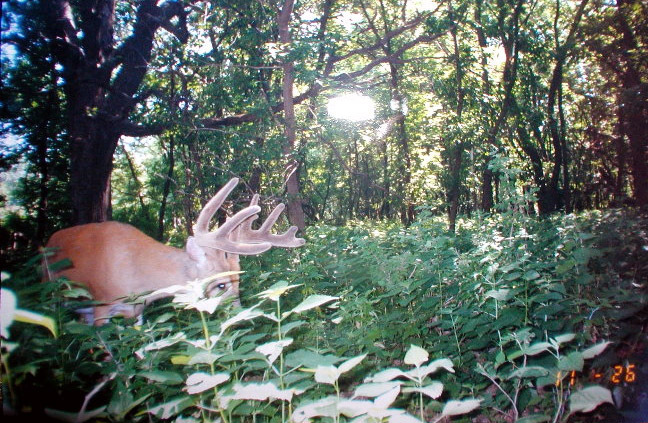 The last photo is of a nice warrior buck. 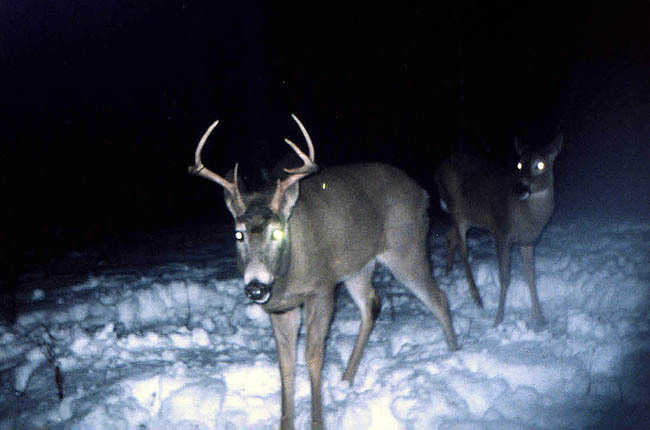 Note the menacing brow tines and the battle scar below the eye. January, 2004. 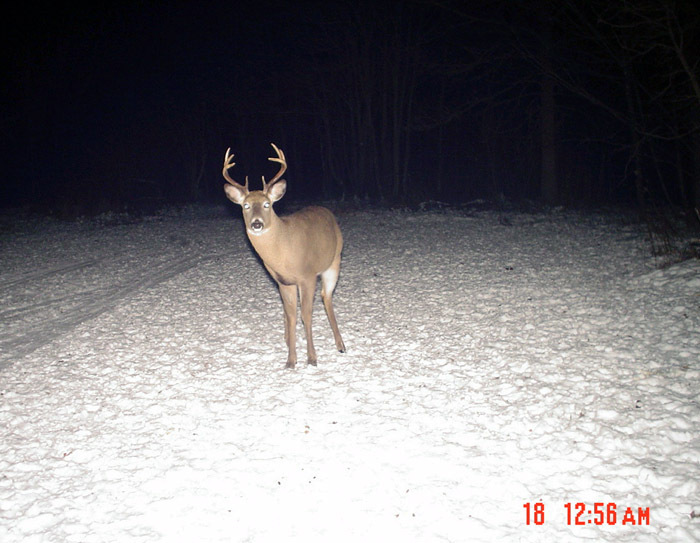 This young 8 point buck casually walked past the camera two days after the end of the season. He seems content traveling at high noon. 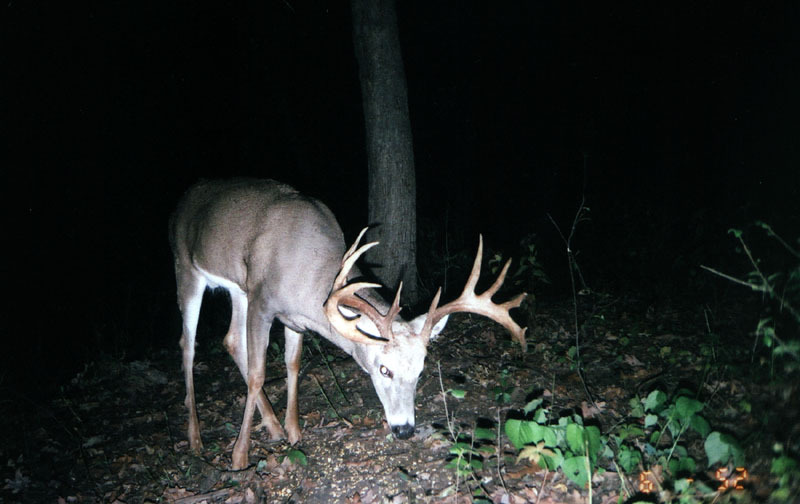 This good looking full-rack buck was seen during hunting season, but never presented a shot. It will be interesting to see his progress in the coming years. 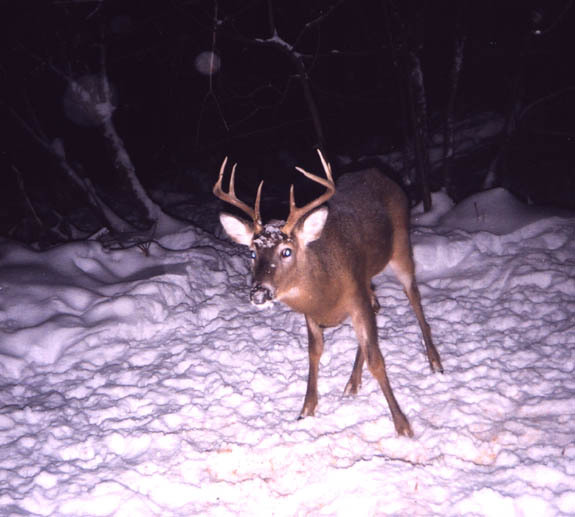 I later found his shed antler that spring.